Kanban Task Manager - Task sharing, organization and visualization inside SharePoint and Outlook. Color code tasks by project or responsible and drag and drop them between phases – these are two of the benefits you get when using our kanban boards for Outlook or SharePoint. With the Kanban Task Manager SharePoint editions, all ongoing projects and tasks can be seen in SharePoint by all team members. The SharePoint editions are intended for workgroups, and a subscription allows an unlimited number of installations and users within the organization. There is also a personal kanban board for Outlook, Kanban Task Manager Single that can be used to keep track of both private tasks and business tasks. The subscription allows one installation. 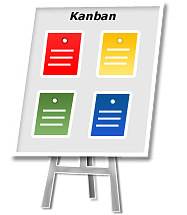 Kanban is a Japanese word for "visual card", and it refers to a way of visualizing work, to make it flow and reduce waste of time. The traditional kanban board has cards that tell what and how much should be produced and when it should be done. When you get such a visual picture of the work process they can quickly reveal bottlenecks and blockers. Less time is spent on trying to sort out how projects are coming along, because everything is visible on the kanban board. We can give a nice, colorful user interface. It is easy to drag and drop tasks between different phases of a project. You will have it all in front of you in the computer and don't have to go to another place to see the work process. Color code tasks by project or responsible. No cards or pieces of paper are lost because they fall to the floor or someone takes them away to make a note. Tasks for multiple projects/categories can be displayed in one Kanban board. A details pane shows the task description and makes it possible to manage a task without opening it. Search both subjects and body texts of the tasks. Additional views make it possible to study and work with tasks from different angles. Excel reports can be generated. Data can be studied and visualized with all the features of Excel.